The Virginia Key Master Plans include a public boat ramp as an amenity to increase public access to the water. A small public boat ramp has existed on the west side of the Marine Stadium for a long time. The City has plans for an improved launch and two finger docks. Along with the launch area, a massive parking area for 108 (originally 90) trailers has been planned. The planning process is completed and the City Commission passed a Resolution for funding for Phase 2 Construction. Total Fiscal Impact: $2,500,000 ($1,250,000 City funds and $1,250,000 FIND match). Both the Virginia Key Alliance and the Virginia Key Advisory Board feel this project needs a holistic approach with consideration to impact on both land and water. 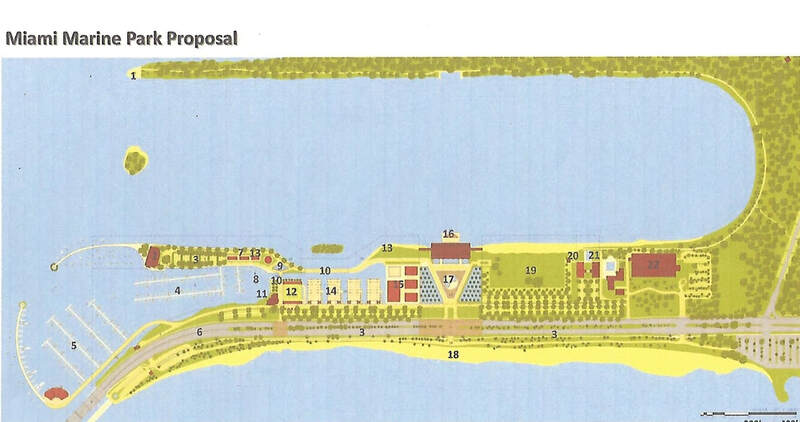 Above is one of the original plans for the Marine Stadium area: A beautiful park with nary a parking lot in sight. The trailer parking area is huge, an unsightly use for an area that was supposed to be a PARK not a parking lot. The parking lot is a revenue generator for the City, so maximizing the spaces is their goal - but not the goal of the Virginia Key Master Plan. The trailer parking is to the west of the Marine Stadium. To the east is the huge, barren cement area that hosts the International Boat Show four months out of the year. For the rest of the eight months it is an ugly, unappealing area that is used for - wait for it - a parking lot. The Marine Stadium is considered the "jewel" of this area and should be the focal point for all projects surrounding it. The management of the Marine Stadium should be completed first, before other areas are developed - the Request For Proposal (RFP) for management of the Stadium has just been opened. The Boat Show affects everything that is done in the Marine Stadium area because it shuts everything down for four months out of each year - and during the prime winter tourist season. The public boat launch would have to be shut down for the Boat Show. The boat launch and trailer parking should be deferred until after the Marine Stadium operator has been selected and a holistic plan for use of the entire area created. Funding provided is for projects available for public use. If the public is restricted from using the launch for four months out of the years due to the Boat Show, then the project could be in violation of funding regulations. The Rickenbacker Causeway is already heavily trafficked on the weekend. Vehicles hauling boat trailers coming from the mainland have to turn left, against traffic, to get into the trailer parking lot. No traffic light is planned - backups are anticipated creating potential safety hazards for motorized vehicles and cyclists. The Virginia Key Advisory Board (VKAB) has "grave reservations" about proceeding with plans as currently presented as they do not take into account the interaction of all uses of the area.